The Engine is a fully customizable collection of physiologic systems. It includes models for anatomy-based biological systems and medical equipment. We developed an advanced engine through a top-down approach, with the ability to easily increase fidelity and manipulate system models. It can be integrated with other software and hardware platforms and devices. 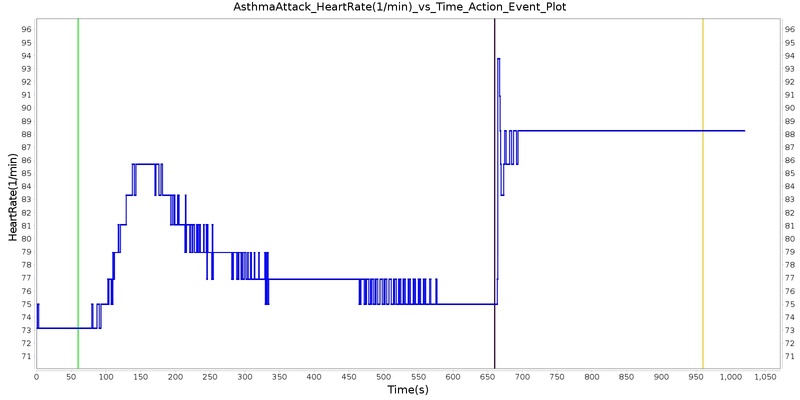 Computational modeling and analysis of the human physiology is extremely useful for various applications. 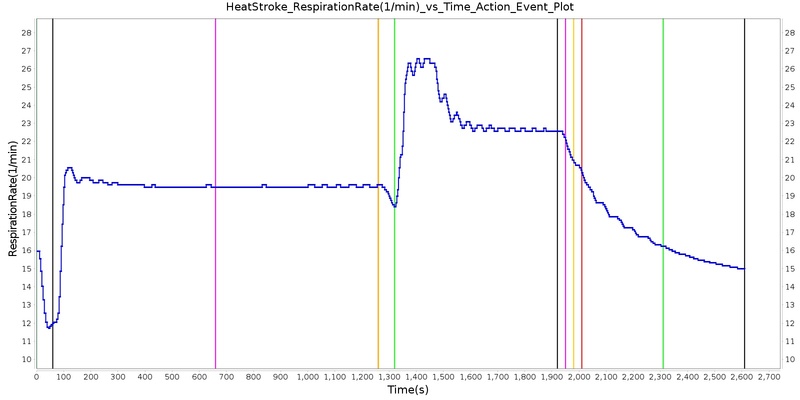 There are many approaches for simulating the body's response to various stimuli. Some existing software uses state-based calculation that can only provide a limited amount of data, by way of preprogrammed responses. Complex interactive effects are difficult with this approach because it uses additive or purely multiplicative responses. Some existing high fidelity models use more complex computational fluid dynamics (CFD). One major drawback of this approach is the significant computation resources required. Cellular, molecular, and genetic models are difficult for whole body physiology. Using this low-level individual cell and receptor methodology often does not provide the level of data a clinician requires for informed decision-making. 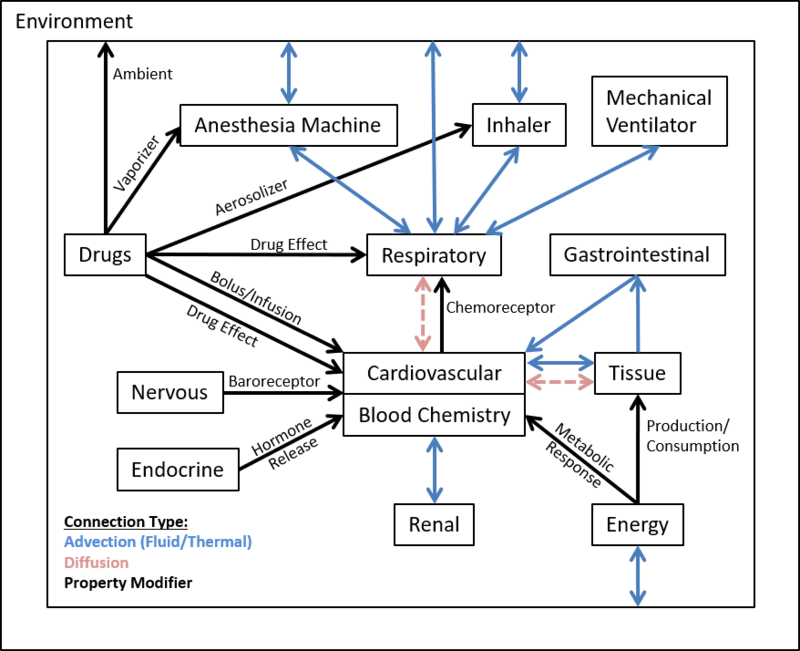 Physiologically-based pharmacokinetic (PBPK) modeling focuses only on drug interactions, and is generally designed to deal with specific pathophysiology. The engine is designed to be a deterministic multiscale modeling application that can be integrated with all other types of physiologic software. Models at any anatomical level can be implemented within the existing infrastructure. Figure 1. The engine uses a top-down approach to model development with bottom-up hooks for expansion. The engine is the combination of lumped parameter mathematical models that, together, simulate whole body physiology. Each system contributes to the maintenance of homeostasis. The systems are designed to be modular and each has the ability to work in isolation. They are all reliant on the Common Data Model (CDM) connections and leverage several generic solvers and transport algorithms. The system as a whole needs to be easy to use and modify, modular, and extensible to virtually any fidelities. Envisioned end user groups include game developers, mannequin builders, educators, researchers, sensor system developers, and trainers. Several of these users utilize the engine in a way that requires faster than real time processing without access to computational resources that exceed a personal computer. The engine uses differential equations with control-based feedback mechanisms to dynamically respond to parameter changes. It is designed and tuned around a stable resting physiologic state, with the ability to model pathophysiology through insults and intervention action calls. Many of the system circuit elements are modified based on substance concentrations and external action (i.e., insult and intervention) modifiers. The Anesthesia Machine is directly connected to the Respiratory System through an inter-circuit connection. The current implementation creates a combined circuit for analysis; therefore, the combined circuit is calculated as one large circuit with a single fluid. Substances can be administered by inhalation directly to the Respiratory System or through a connected Anesthesia Machine through the vaporizer component. The Respiratory System transfers substances back and forth to the Cardiovascular System using Alveoli Transfer. 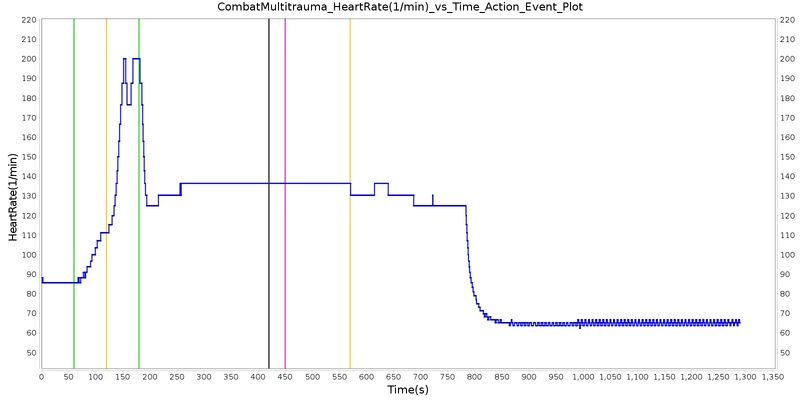 The only direct connections between the two systems are simple modifiers to the heart rate and a cardiovascular resistance value during the tension pneumothorax insult. The Cardiovascular System is also tied to the Endocrine System and ECG. Substances can enter directly into the Cardiovascular System through bolus injections or the administration of an IV. Interactions between systems, such as alveoli transfer and diffusion between the extravascular and vascular space are modeled in the System Interactions methodology. This ensures each system is responsible for only its own behavior while capturing the behavior that occurs between systems. Figure 2. Overall the engine data flow diagram showing all of the systems. Dashed lines are only present for certain actions. Non-italicized elements are defined as classes in the engine. 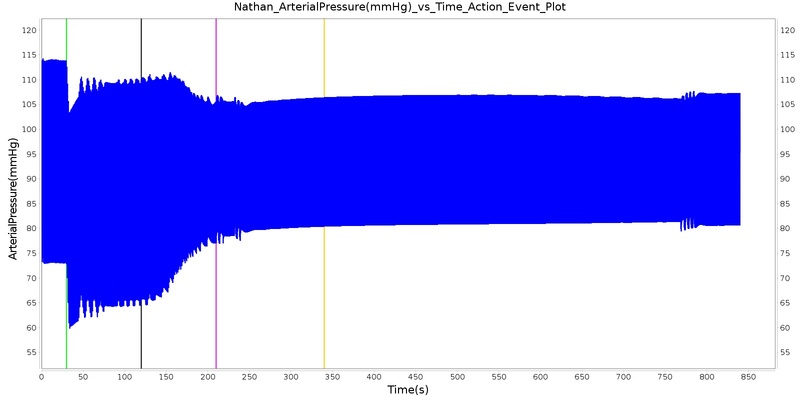 The entire engine works off of a transient analysis time step of 0.02 s (50 Hz). All system states are recalculated every time step. The differential equations that determine changes are linearized to approximate system variables, but the small time step provides a very accurate solution. Baseline - The original resting physiology set-point. Baseline values are often assigned by the patient parameters. These values generally only change hen conditions are applied. Current - The time step that has already been calculated. The current values are used to determine the values for the next time step elements based on system feedback mechanisms. Next - The next values are what will be used to calculate the system state on the next process call. The engine stabilizes with a multi-step process. The engine must be initialized and reach a stable state prior to modifying the patient condition. 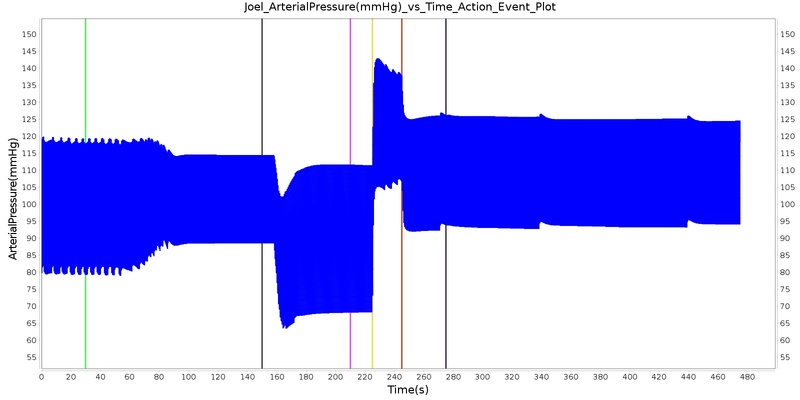 This is completed by using a dynamic stabilization protocol to execute the engine until a specified set of criteria are met, then any patient chronic conditions are applied. These conditions modify patient parameters and model values to represent the new patient state. The engine must restabilize using the dynamic protocol to achieve a stable state. This process is outlined in Figure 3. Figure 3. Overall the engine stabilization protocol. This highlights the multi-step process required to initialize either a healthy or chronically ill patient prior to executing a scenario. The engine must perform numerous cycles of the calculations to reach a point of convergence for the output values, such as heart rate, tidal volume, systolic pressure, etc. When the engine has reached this convergence point, it is considered to be stable. 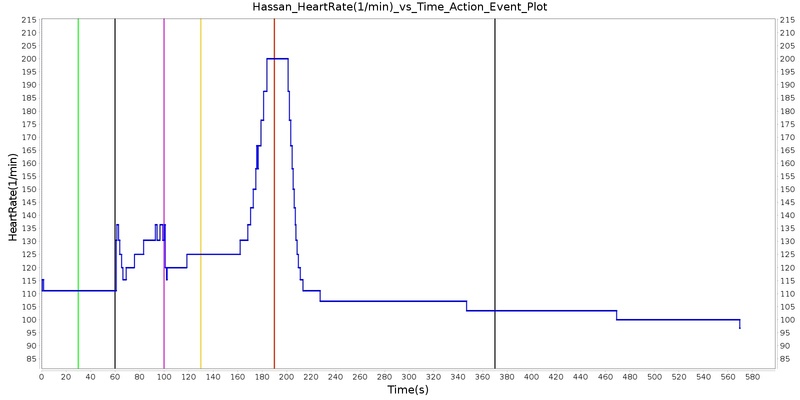 During the stabilization period, the majority of feedback in the engine is inactive. 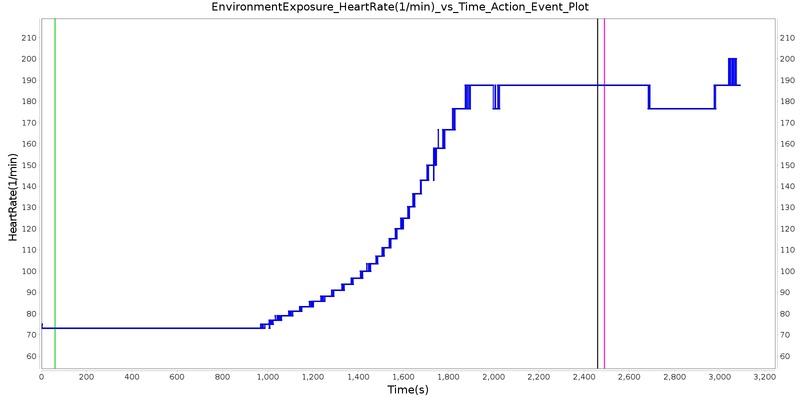 An exception is the Tune Circuit methodology found in the Cardiovascular System. This modifies the cardiovascular circuit parameters to achieve the mean arterial pressure specified in each patient file. 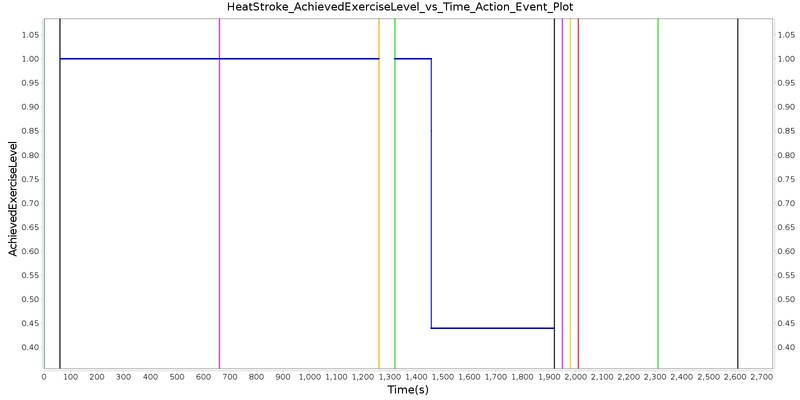 For more information on this function, see the Cardiovascular Methodology. No actions or conditions can be applied during the stabilization time. Because the patient parameters may vary in the patient file, the time required for the solution to converge may vary. 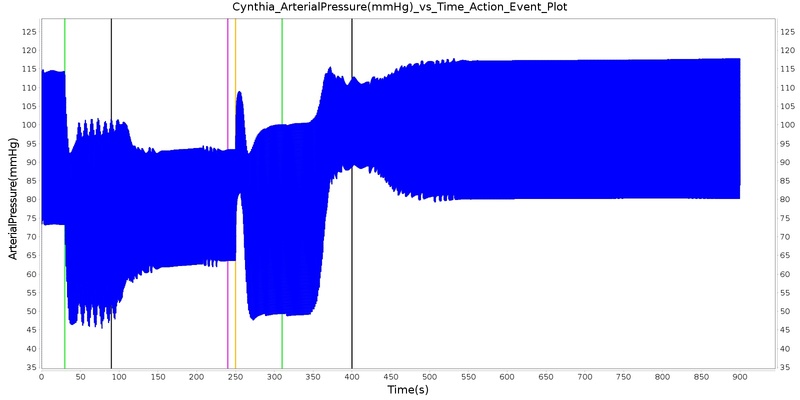 By using a dynamic stabilization algorithm, the engine will be fully initialized and the solution will have converged at the conclusion of the stabilization period for any patient. 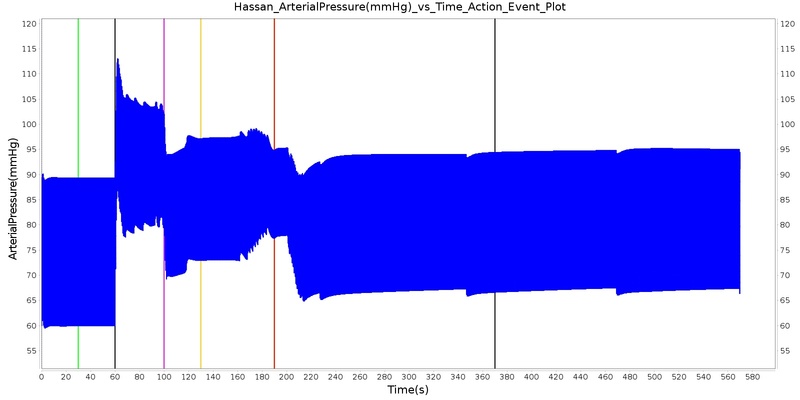 This stabilization algorithm also prevents an unnecessarily long time for a solution that may be required in the time that were statically specified for all scenarios and patients. 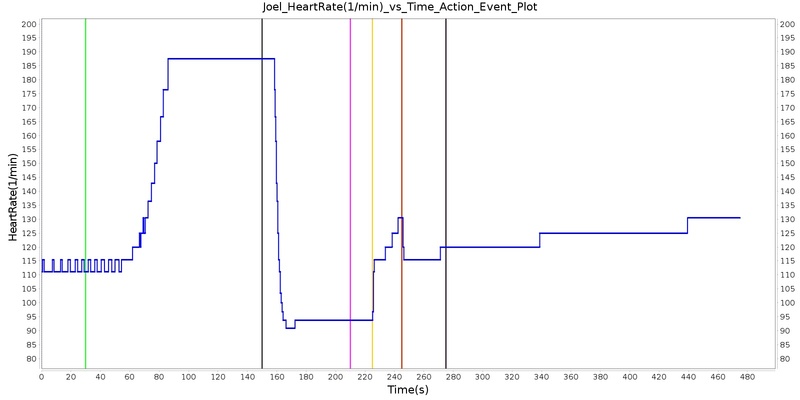 To determine the convergence time, the engine uses a dynamic stabilization algorithm. The stable outputs were analyzed to determine the variation present in each individual output over time. This percent variation was identified for the key outputs in each system. 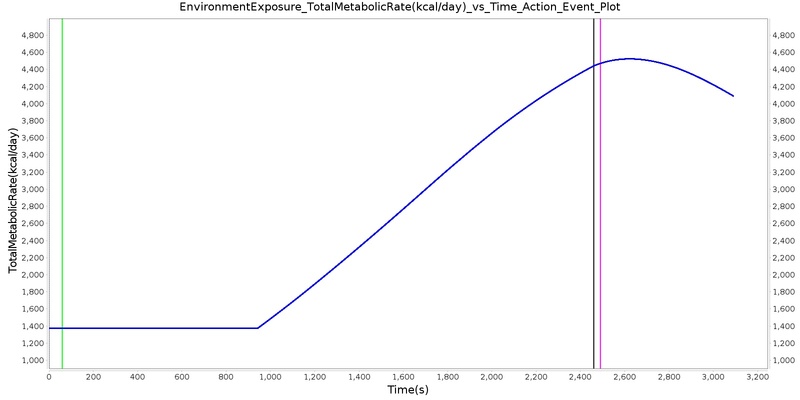 The percent difference between the current time step and the next time step is calculated for output. The percent difference calculated must be less than the identified convergence criteria for the output. This must be maintained for the convergence time. 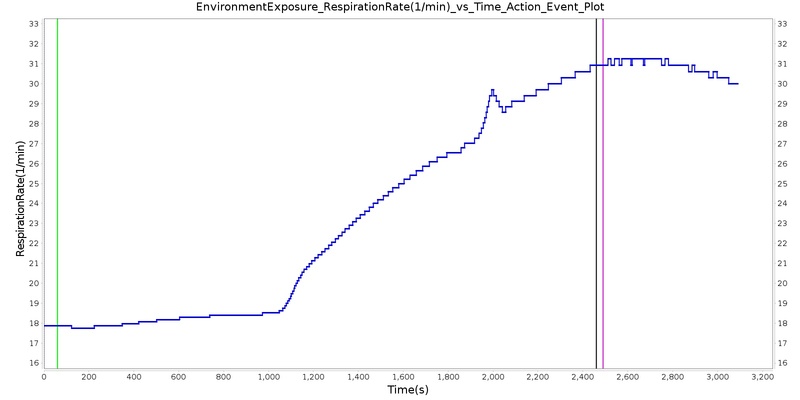 This time is specified at approximately seven respiratory cycles (at 16 breath/min -> ~25 seconds). The respiratory cycle was chosen because it is the has the longest period. Convergence should occur over the longest periodic cycle in the engine to ensure variation is not at a low frequency. Currently, the convergence criteria and time are specified in the CDM. 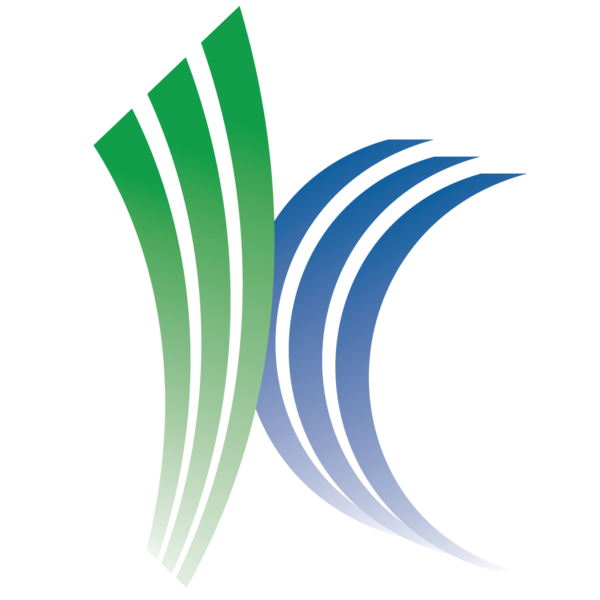 In the future, the algorithm implementation will remain in the CDM, but the convergence criteria (including time) will be moved to an XML file, similar to patient and substance files, for easy manipulation by the user (see PatientData and SubstanceData for more information). Patient conditions that are persistent or recurring are chronic conditions. The human body responds differently to chronic conditions than it does to acute conditions. While the body is in an altered state, which may be weaker, the body's response to the condition becomes damped over time. In short, the body reaches a new level of homeostasis that may not be considered healthy, but does not have the same continual feedback mechanisms operating that occur when acute conditions cause a deviation from homeostasis. To implement these conditions in the engine, a two step stabilization process was implemented. As discussed above, the dynamic stabilization criteria was required to ensure all outputs converged prior to performing any actions (insults or intervention) in a given patient. This is true for conditions, as well. However, after a condition is applied the solution must again converge to represent the body's new homeostatic state, that while different from the healthy homeostasis, is still a stable patient state. The same convergence methodology is used for this second convergence. However, a set of convergence criteria for the outputs must be specified for each condition. This criteria reflects the new variation in outputs over time that may exist during the condition. Examples of these conditions are anemia, pericardial effusion, and arrhythmias. More information on these can be found in the Cardiovascular Methodology. There is no limit on the number of conditions that can be applied at one time. However, testing an validation of outputs when combining conditions has not been performed. In the future, when a user applies multiple conditions, a merging algorithm will be used to combine the convergence criteria. This will specify the least stringent requirements as the final convergence criteria for the combined conditions. Preprocess is called for each system individually and is generally used to modify the circuit elements based on feedback mechanisms and actions. This is also where any system drivers are determined for the upcoming time step, such as the heart contractility or ventilatory drivers. At the start of every Preprocess step, the next time step circuit element values are initialized to the stored baseline values. Generally speaking, elements are updated by getting the next value and using multipliers before setting it again. This allows for the "stacking" of modifiers and the ability to alter the same element based on any number of mechanisms. Process generally determines the entire next time step circuit state. The generic circuit solver is leveraged to automatically calculate unknown circuit variables. Substances are also transported throughout and between systems with general equations - usually based on path flows or absorption and diffusion coefficients and renal and hepatic clearance factors. Postprocess advances time by moving the next time step values to the current time step values. The next values are then set to the baseline values in preparation for the upcoming Preprocess call. Figure 4. This shows the repetitive three-step process used each time step to determine the system states. These three processes are mirrored in each system's code and are sequentially called by the engine. Compartments are implemented as conceptual physical divisions of the body. Anatomical data can be pulled from each compartment through optional node and path mapping. Compartments can be further discretized into smaller sub-compartments with a hierarchical relationship as you drill into various systems. In engine, compartments can be defined to encapsulate circuit nodes that allow easy organization, access, and synchronization of all system parts. Figure 5 shows an example of how compartments can be defined in the Cardiovascular System. Figure 5. This is an example of possible Cardiovascular System compartments. This is for explanation purposes only and not necessarily indicative of how things are really defined. See the Cardiovascular Methodology documentation for how they are really defined. Users can customize scenarios by modifying a variety of file types. For example, patients, substances, compound substances, and environments can all be modified via the text files provided. This allows users to customize scenarios by tailoring patients and environmental conditions to the specific circumstances of the user. As an example of this flexibility, the code base contains a variety of patient files. These parameters in these patient files can be specified to represent different physiologic states for a patient. See Patient Methodology for details. For more details on interfacing with the engine, see the engine documentation. The engine uses a low fidelity clinical approach and is not necessarily for high fidelity predictive purposes. It is also assumed to be contained within the CDM. See the individual system methodology documents for more specifics. Several scenarios have been developed and validated to ensure proper interaction not only within, but also between the physiologic systems. These patients and scenarios were developed as part of the HumanSim: Sedation and Airway project funded by TATRC, contract number W81XWH-11-C-0045. The combined effects scenarios were validated qualitatively from available literature and from the opinions of subject matter experts (SME). More detail on patient parameters can be found in the Patient Methodology documentation. A summary of the validation is shown in Table 6. Green indicates good agreement with validation data, yellow indicates agreement with a general trend with some minor disagreement, and red indicates a disagreement with the validation data. The number indicates the number of output parameters for each category of validation success or failure. Table 6. Validation scenarios were completed for five patients subjected to a variety of insults and intervention: Cynthia, Gus, Hassan, Joel, and Nathan. The resulting effects of each individual insult and intervention were validated both qualitatively and from subject matter experts. Green indicates good agreement with validation data, yellow indicates agreement with a general trend with some minor disagreement, and red indicates a disagreement with the validation data. The number indicates the number of output parameters for each category of validation success or failure. Although the tidal volume is not shown for these scenarios, it should be noted that mild to moderate discrepancies between the tidal volume set on the anesthesia machine and that observed for the patient were observed in the engine. This is also a common observation in clinical practice, because the anesthesia machine may have to overcome the patient condition and airway resistance to provide sufficient tidal volume  . The Cynthia scenario begins with the administration of midazolam at 50 seconds with a full severity airway obstruction occurring at 110 seconds. 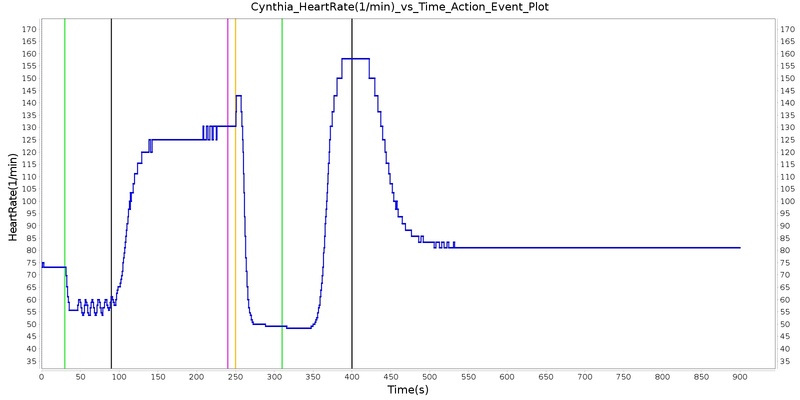 At 260 seconds a ventilator mask is placed on Cynthia. Twenty seconds later, the airway obstruction is removed and 30 milligrams of ketamine are administered via a bolus injection. Rocuronium is administered one minute later, and Cynthia is intubated 40 seconds after that. The Cynthia scenario shows excellent agreement with the qualitative and expected SME trends. However, there is a minor inconsistency in the systolic and diastolic pressure decrease following the administration of midazolam. The SME validation predicted a 15-25% decrease in systolic/diastolic pressures following the administration; however, the observed decrease was approximately 10%. This decrease was considered acceptable since other references predicted varying degrees of pressure decrease. Figure 6. 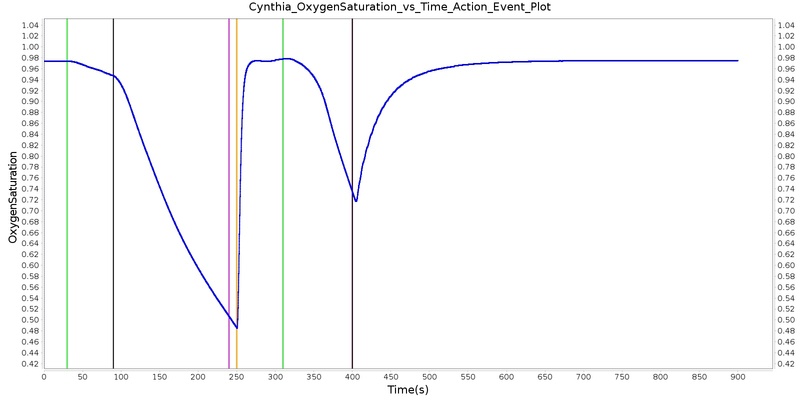 Select outputs from the Cynthia combined effects scenario. Table 7. 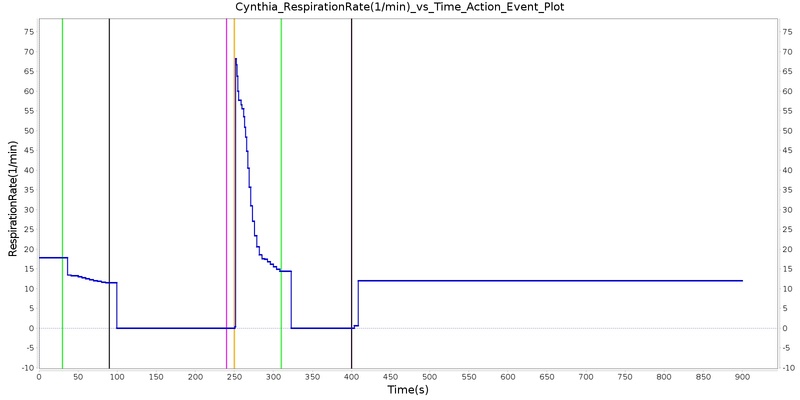 The Cynthia scenario displays the effects of sequential midazolam administration, airway obstruction, ventilator mask, ketamine and rocuronium administration, and intubation. This scenario shows some good agreement with the expected qualitative and SME trends. Administer Midazolam - 3 mg Drug Onset in 1-3 min 30 90 Mild Increase ; 5-10% Decrease  Moderate Decrease ; 15-25% Decrease  Moderate Decrease ; 15-25% Decrease  Moderate Decrease ; Marked Decrease to 0  As long as some respiration rate, little change. 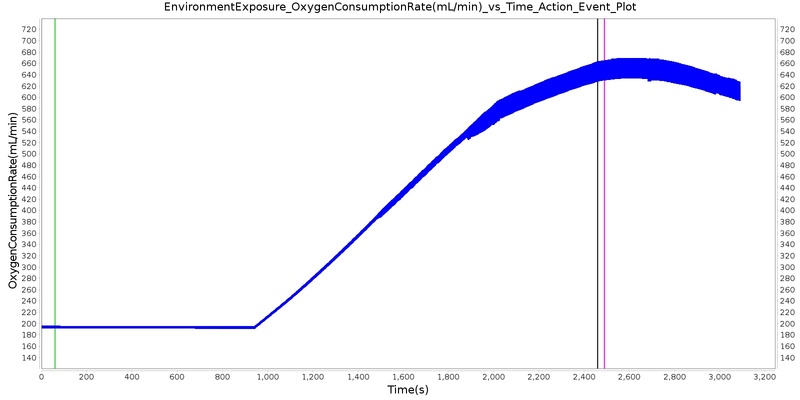 If RR=0, then begins to drop along O2 curve. 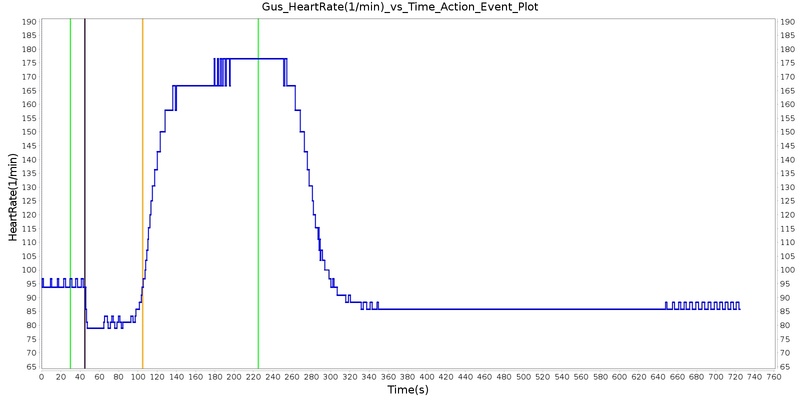 A ventilator mask is applied to Gus at 50 seconds, and succinylcholine is injected one minute later. After an additional minute, an unsuccessful intubation occurs, leading to the endotracheal tube residing within the esophagus. After two minutes the tube is removed and correctly set in the trachea. The produced results show excellent agreement with the expected validation trends. Figure 7. 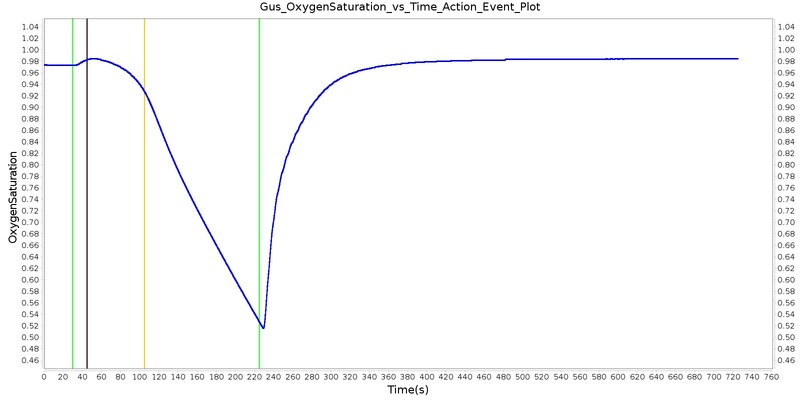 Select outputs from the Gus combined effects scenario. Table 8. 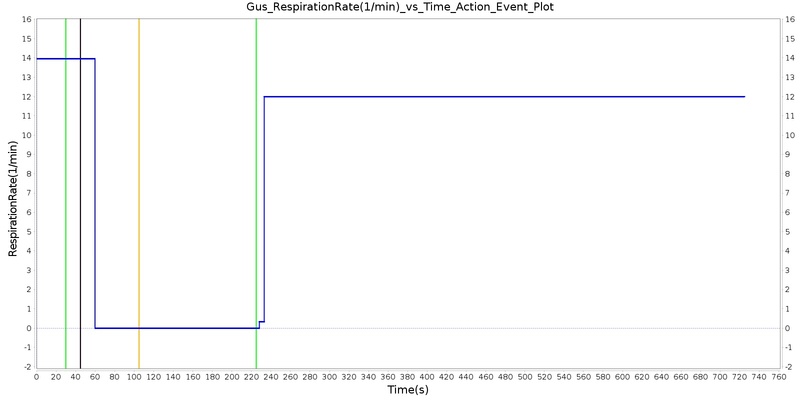 The Gus scenario displays the effects of sequential ventilator mask application, succinylcholine injection, esophageal intubation and then a successful endotracheal intubation. This scenario shows good agreement with the SME and qualitative validation. 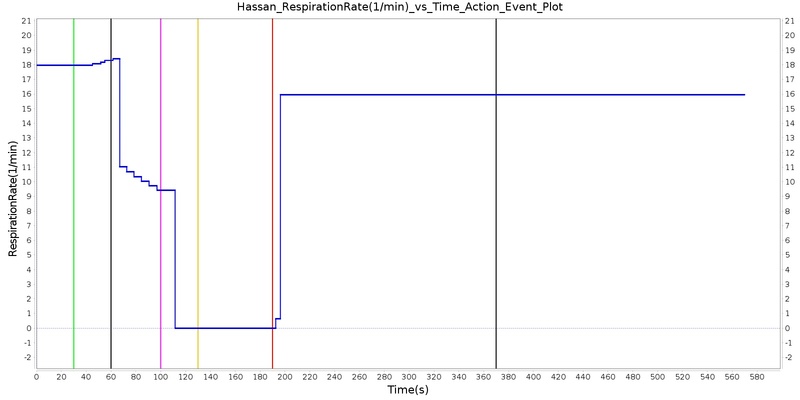 At the beginning of the scenario, a ventilator mask is applied to Hassan. He then receives bolus injections of ketamine and succinylcholine. This leads to an increase in the heart rate and arterial pressures due to the ketamine injection. The respiration rate begins to decrease as the patient begins to lose consciousness. After the succinylcholine injection, there is a decrease in the heart rate and arterial pressures. In addition, the respiration rate falls to zero due to the neuromuscular block. At 180 seconds, an endotracheal tube is set into the right bronchi, leading to only one lung being ventilated. This leads to a minor reduction in the oxygen saturation. Due to the reduced oxygen intake, the heart rate and arterial pressures begin to increase to compensate. The tube is reset into the trachea and the vital signs begin to return to normal. All of these trends follow the expected validation trends. Figure 8. 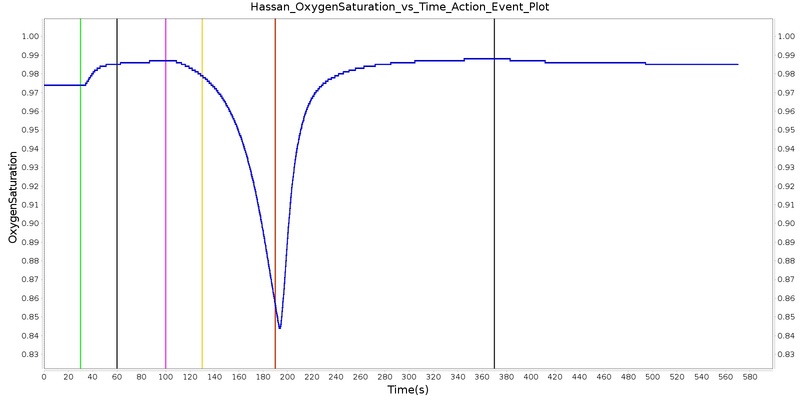 Select outputs from the Hassan combined effects scenario. Table 9. Hassan displays the effects of a right mainstem intubation after the patient has been injected with ketamine and succinylcholine. 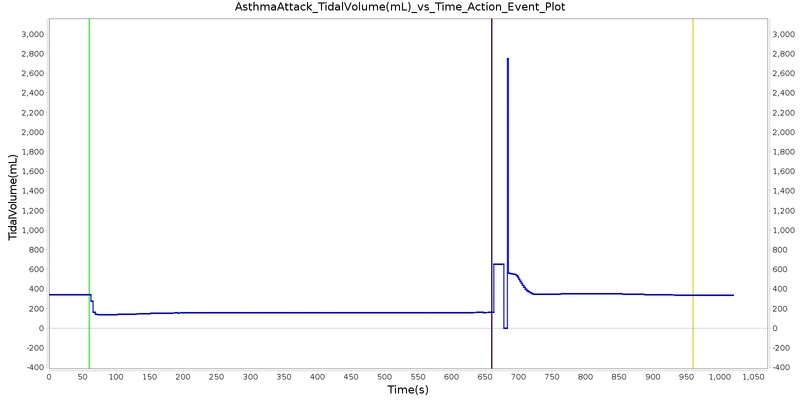 The engine output shows complete agreement with the validation trends. The Joel scenario begins with a full severity airway obstruction at 50 seconds. This leads to decreasing oxygen saturation and increasing heart rate and arterial pressures due to the sympathetic (endocrine) response. At 170 seconds, the obstruction is removed and the vital signs begin to return to normal. 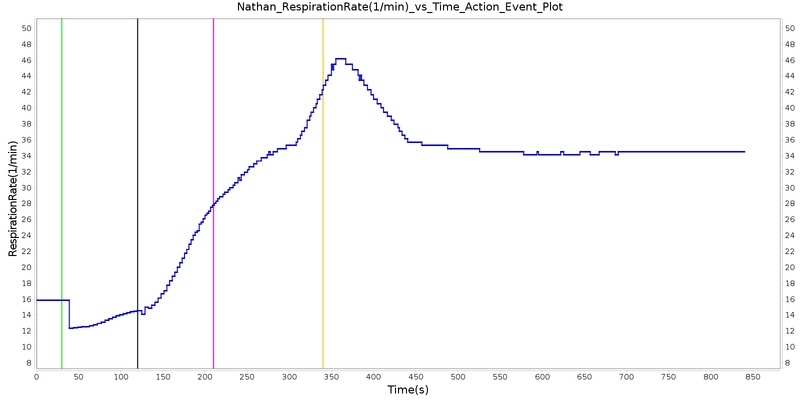 A ventilator mask is applied to Joel at 230 seconds, and he receives a 27 mg bolus injection of etomidate at 290 seconds. This leads to decreasing arterial pressure. At 310 seconds, a bolus injection of succinylcholine occurs before an endoctracheal tube is set 30 seconds later. The administration of succinylcholine leads to immediate decreases in heart rate, arterial pressures, and oxygen saturation. After the intubation occurs, the oxygen saturation begins to return to normal due to adequate ventilation. All of these results show strong agreement with the subject matter expert's expected trends. Figure 9. 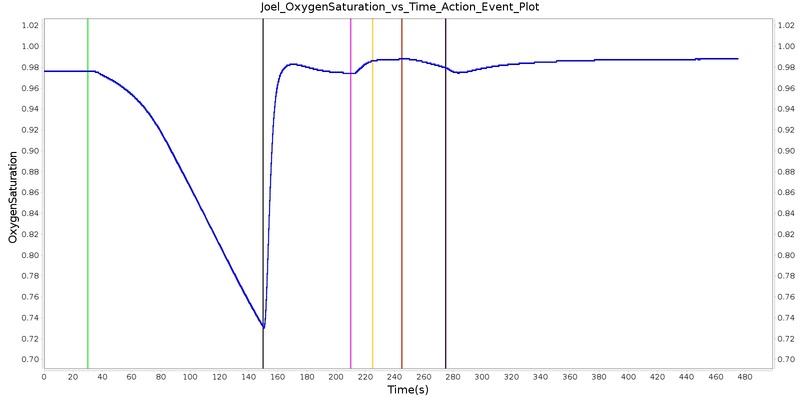 Select outputs from the Joel combined effects scenario. Table 10. 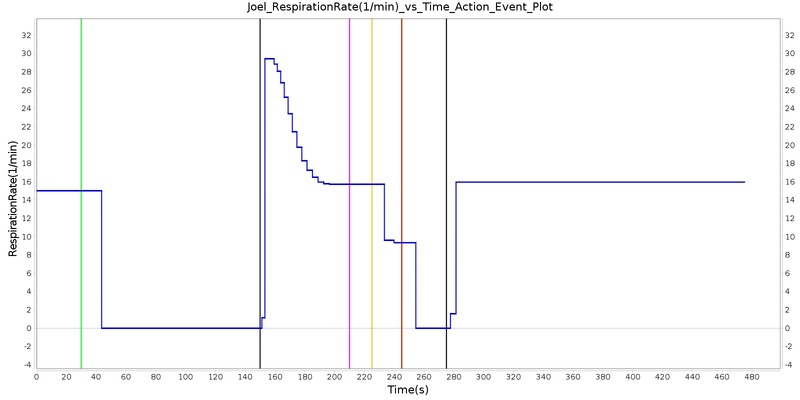 The Joel scenario displays the effects of sequential airway obstruction, ventilator mask application, etomidate administration, succinylcholine administration, and intubation. The engine results show excellent agreement with the validation trends. Nathan receives a bolus injection of fentanyl at a dose of 150 micrograms at a scenario time of 50 seconds, and a ventilator mask is placed at 140 seconds. Due to the administration of fentanyl, there is an observed decrease in the heart rate, arterial pressures and respiration rate. There is very good agreement with the expected trends during this time period. The The respiration rate is expected to decrease by 15-25%; however, the observed increase is approximately 10%. This was acceptable due to the trend expressed in other validation resources. The oxygen wall connection loses pressure at 230 seconds. This leads to decreasing oxygen saturation and increasing heart rate and arterial pressures due to the epinephrine response. 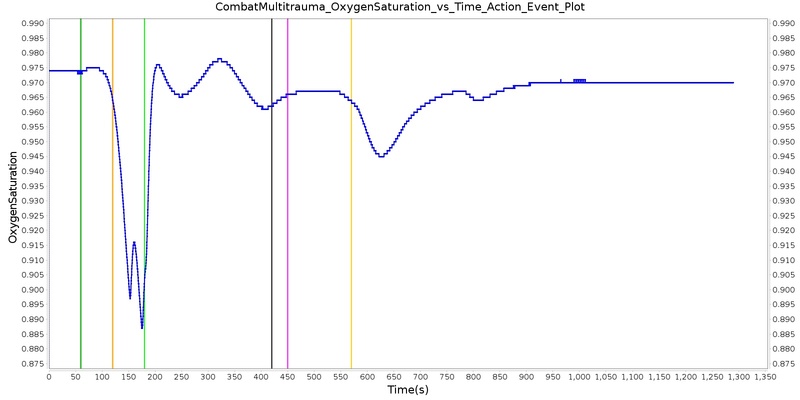 Following this, the connection is reset to a secondary oxygen tank, and the vital signs return to normal. This behavior matches the validation trends. Figure 10. 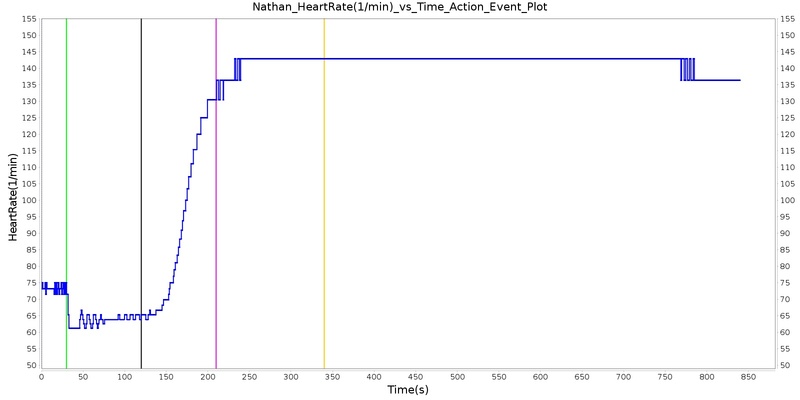 Select outputs from the Nathan combined effects scenario. Table 8. 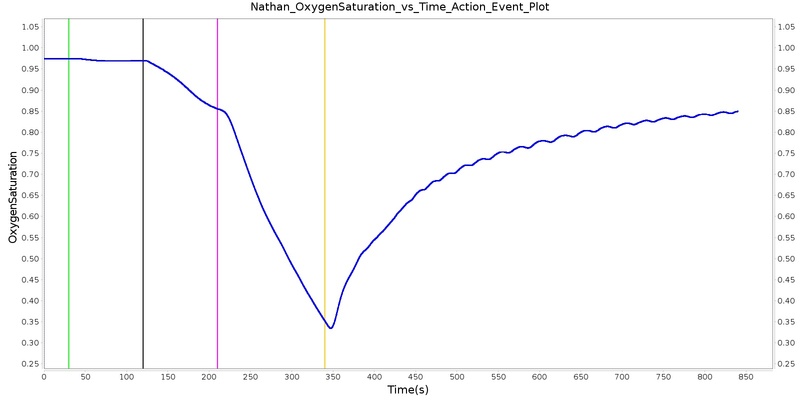 The Nathan scenario displays the effects of sequential bolus fentanyl injection, ventilator mask application, and oxygen wall pressure loss. The engine results show strong agreement with the validation trends. 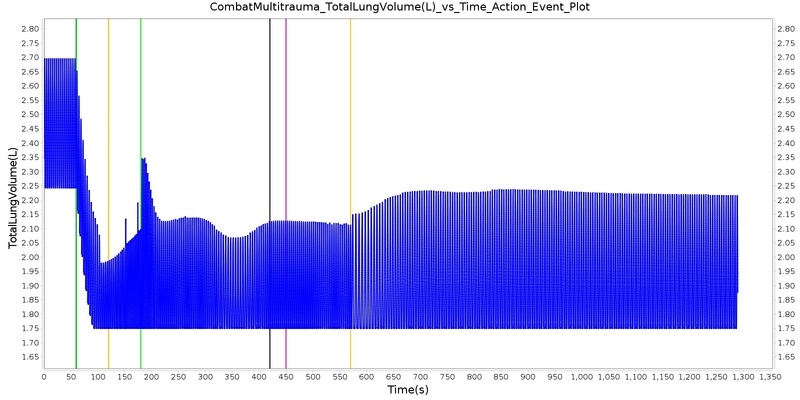 Four scenarios were created to showcase the ability of the open-source physiology engine to simulate complex and combinatory insults and interventions. The Showcase Scenarios demonstrate the ability of the engine to fill the physiology simulation needs of the medical simulation community. A team of soldiers is conducting a patrol when an explosive device detonates, injuring one of the soldiers. The squad medic applies direct pressure to a hemorrhaging wound, and, suspecting a tension pneumothorax, performs a needle decompression. Direct pressure is not controlling the bleeding, so a tourniquet is applied. Morphine and IV fluids are administered. See Combat Multitrauma Validation Matrix for complete details on validation. Figure 11. 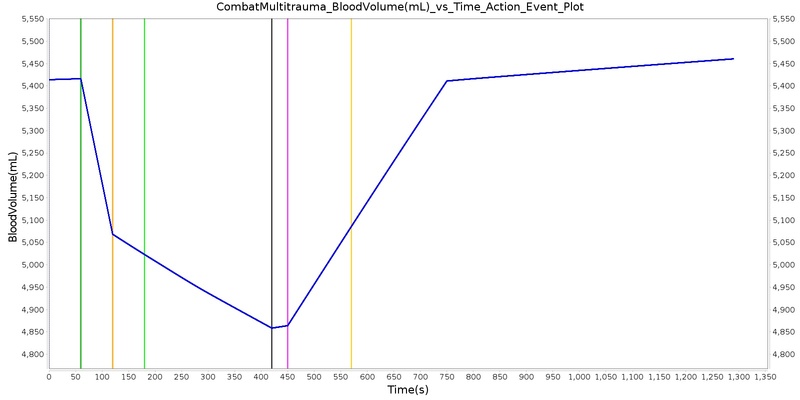 Select outputs from the Combat Multitrauma showcase scenario. A 40 year old female with a history of asthma is having an asthma attack. She arrives at the hospital ten minutes after the beginning of the attack. A doctor administers albuterol and her condition improves. 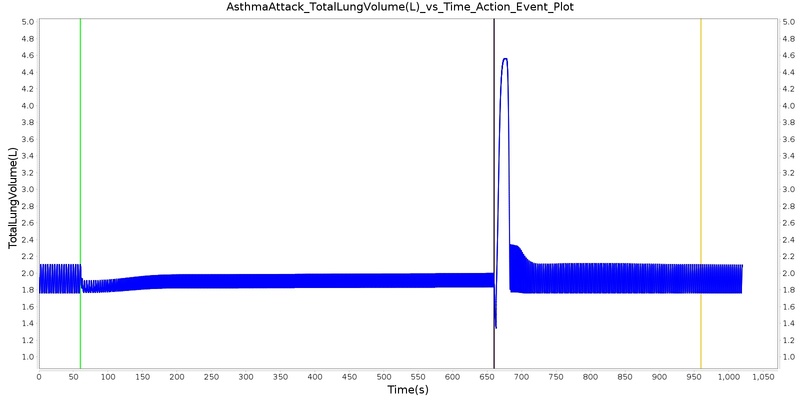 See Asthma Attack Validation Matrix for complete details on validation. Figure 12. 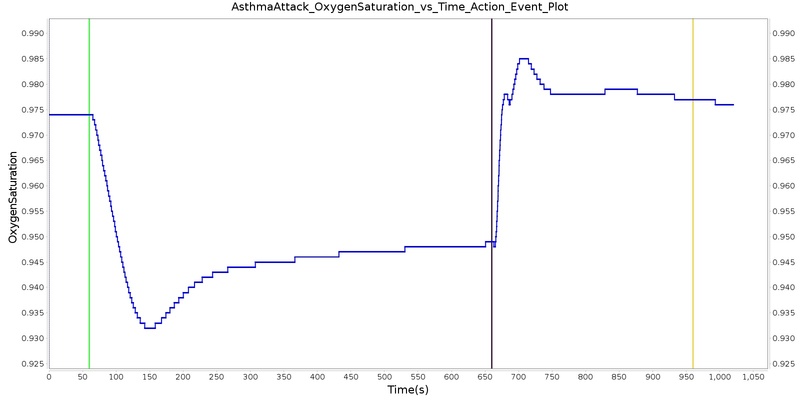 Select outputs from the Asthma Attack showcase scenario. A 25 year old male is hiking towards a rock formation to begin a recreational free climb. During the hike, he is working at ~10% of his maximum capacity. The man arrives at a rock formation and begins climbing at an intensity of ~1/2 of his maximum capacity. At the top of the rock formation, the man becomes dizzy and passes out. An off-duty medic takes action to treat a heat injury. 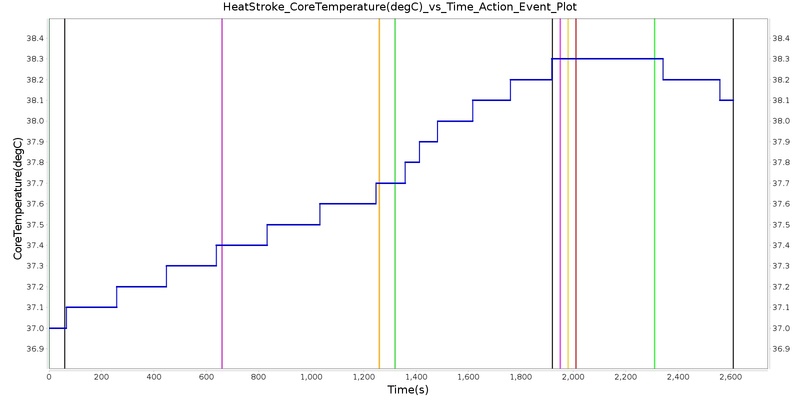 See Heat Stroke Validation Matrix for complete details on validation. Figure 13. 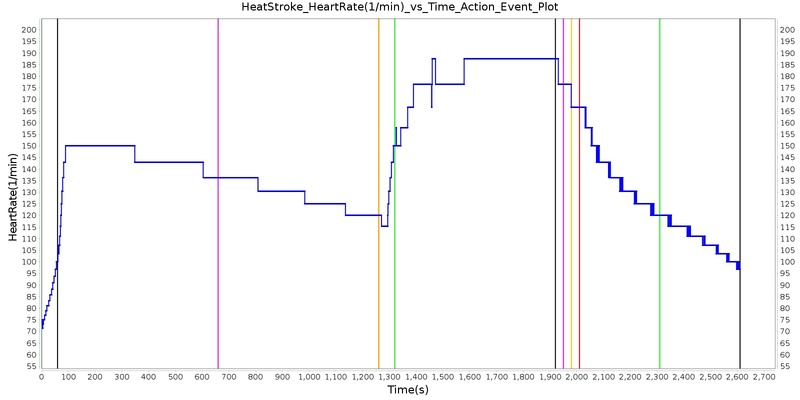 Select outputs from the Heat Stroke showcase scenario. A 17 year old female leaves her Alaskan home in the mid-winter to retrieve a newspaper. The door closes as she exits the house. She is stuck outside for 45 minutes where it is -10oC. When the woman's housemates realize that she is outside, they bring her back in and sit her next to a fire. See Environment Exposure Validation Matrix for complete details on validation. Figure 14. Select outputs from the Environment Exposure showcase scenario. 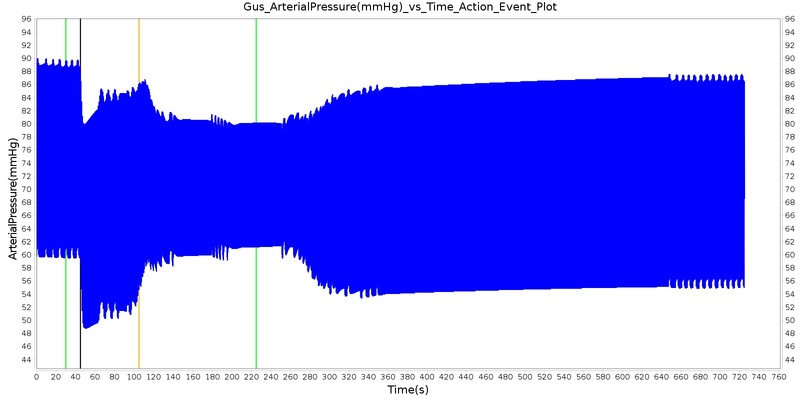 The engine has successfully leveraged the CDM to model and simulate whole body physiology. The interaction of the existing system models was validated by looking at the combined effects of multiple actions on a variety of patients. Virtually everything within the engine is modular and extensible. Fidelity can be changed at any level within the system. The engine is a fully standalone simulator, but can also implement or interface with external software. An area of potential future advancements for the engine includes the integration of differing time step and un-fixed time step models. This could be achieved through simple interpolation and down-sampling, where applicable. Other advanced system dynamics, adaptive step sizes, and mixed fidelity techniques could also be investigated. Investigations into the effects of biological variability and parameter (inputs and outputs) error bound and confidence intervals could be applied throughout.